An Irish family-run card company is banking on our ingrained culture of sending physical greetings as they compete with international giants like Hallmark. 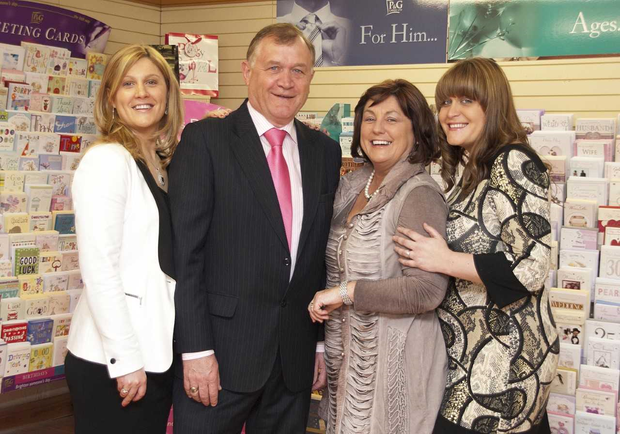 Founded by Pauline and Gerry Naughton in 1988, P&G Cards are celebrating their 30th year in business by handing over the reins to the next generation. The Roscommon-based firm have had to make some difficult decisions to weather through the last three decades, most notably the recession, but they’re the better for it. While many other independent companies fell by the wayside post-2018, P&G’s growth was flat until about three years ago, but has been growing in line with a market level of 2-3pc since then. This positive U-turn is, at least in part, attributed to the talents of the owners’ two daughters who helped them face the financial challenges, and helped them react in an increasing competitive market. Aisling Naughton, Operations Director, is 17 years in the business, while her sister, Deputy Managing Director Michelle Daly, has 18 years under her belt. Mother-of-four Michelle told Independent.ie that, while they are focusing on the five-year succession plan, and looking to expand to international markets, the company has not lost its core values. “The main feedback we get from customers is that we create a really nice card with a lovely message – and at a good price. Part of that local knowledge led to the introduction of a “value card” for customers on a budget when the market crashed, a product which has stood the test of time even as the economy improved. It’s this on-the-ground service to their customer base that ensures P&G’s success, according to Michelle, a benchmark that was set by her mother right from the outset. “We’re now strategically located in the heart of Ireland for easy distribution, with a dedicated sales team covering the entire country, but it was my mother who took to the road herself in 1988. “She set up the business after she was made redundant from the hospital where she trained as a nurse. She spent some time working at her sister’s newsagents in Longford and realised all the cards were wither from the US or the UK – non were Irish. P&G’s main customers here are Dunnes, Musgrave Group, BWG, independent retailers but they also export to Malta, South Africa, Australia, Canada and the UK. They are also now doing bespoke cards for Aldi, giving the supermarket exclusive card designs from their own design company. The company, which employs 47 people nationwide, has a product range of over 2,000 designs and sell 9 million cards annually. Michelle said the popularity of cards here hasn’t waned; while the number of cards purchased for everyday occasions has dropped, seasonal cards – for events such as Mother’s day and Christmas – have really taken off. Other threats that the company acknowledge are currency fluctuations, cost base, and dealing with very long lead times when it comes to manufacturing and ordering from China. With 30pc of their products currently printed in the UK, the company is also concerned about the impact of Brexit. But P&G has continued to pivot in this changing world, diversifying into complementary products, such as seasonal gifts and occasion mugs. “We wanted to provide something that the customer can purchase along with their cards and keep it a low enough price. Retailers are always looking for something new or something different,” she said.